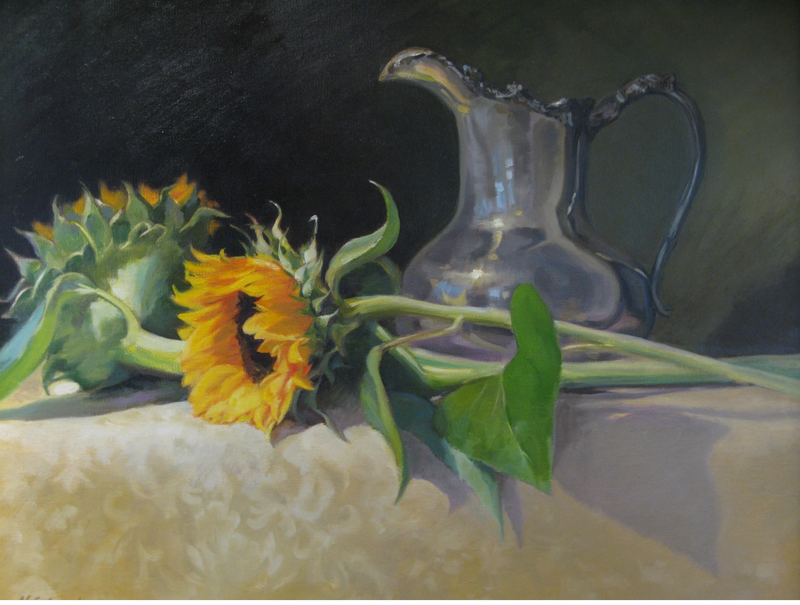 The Jaffrey Civic Center welcomes Hollis, NH artist, Jennifer McCalmont, who will present her Florals and Landscapes Oil Exhibit in the Cunningham Gallery from July 6th to August 3rd. Jennifer Nixdorf McCalmont spent her early years drawing and creating constantly. She attended University of Massachusetts at Dartmouth, ﬁnding a love of ﬂowers and majoring in textile design. Upon graduation Jennifer moved to New York City, to pursue a career in the textile fashion industry. The commercial training gave her valuable design experience and knowledge of color. After moving to New Hampshire Jennifer combined her assets in illustration and creativity to produce her own line of light humor greeting cards, which she marketed worldwide for many years. While raising children, Jennifer put her career aside, but became increasingly intrigued by oil painting and the history ﬁne art. In her quest for art training, Jennifer discovered “The Boston School” of painters, which is not actually a school, but a school of thought and a tradition of painting that has been passed down from teacher to student for more than 100 years. The Boston School has its roots in impressionist ideals, but combines the best of representational painting, seeing color correctly and drawing accurately. Jennifer has learned from many of the Boston school “greats” and is currently studying portrait painting with Mary Miniﬁe. There will be an Opening Reception for her work on Friday, July 6th from 5 pm to 7 pm. The reception is free and open to the public.